glad to see it's contagious! so funny you posted this! i just wrote a post about stripes too (though it's in my queue to post in a few days!). strips are my favorite. i bought 3 of the same exact shirt this winter from ella moss that was black and white striped! p.s. the anthro catalog came today and love those circus pics you posted! 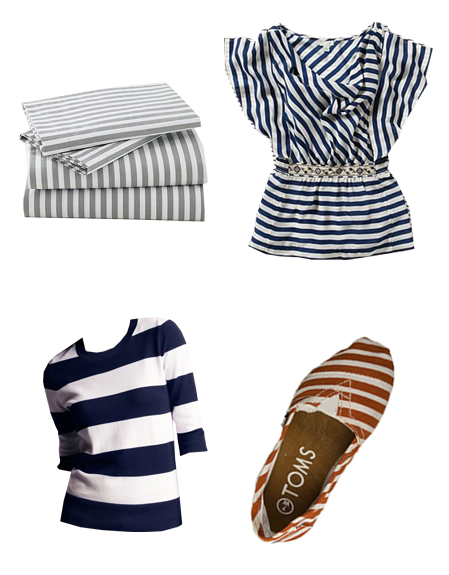 I was just looking at that striped top on Anthro's website yesterday and was contemplating buying it! that top is so cute, may have to go check it out in store! I just bought the striped sweather from the Gap. I love it! stripes will forever be in. totally scored those striped TOMS at Jeremy's last year for $10. I am all over the navy and white stripes and am DYING to make a yellow beaded necklace for an accessory….without it looking like a children's craft project. Here's an amazing stripey shower curtain posted by Anna Spiro. I can make that, right? if you want the best stripey shirt you ever had in your life for only $20, go to gravel and gold on 21st. i just got two and they are instant faves! hooray for stripes! i love toms, they are so comfortable! i'm totally there too and apparently have been for a while. i looked at my closet the other day and i swear, every other pieces was full of stripes. yikes! I LOVE stripes. But I wonder — can you wear them too much? I don't want to be known as the stripe girl….??? I've had a "stripe phase" for about my entire life. It's almost what I wear exclusively, ha. Oh stripes *swoon* In the last month half of my wardrobe ::somehow:: has turned to stripes. Love it! I love the stripes! I especially like the Toms.